The results of the UK’s general election may have left David Cameron the biggest winner in the country — a man whose party has a mandate to govern without forming a coalition, as was predicted — but that doesn’t mean the nation was devoid of other quiet successes. The election’s other big winner was the Scottish National Party, which, under the leadership of Nicola Sturgeon, charged to a resounding victory in Scotland. 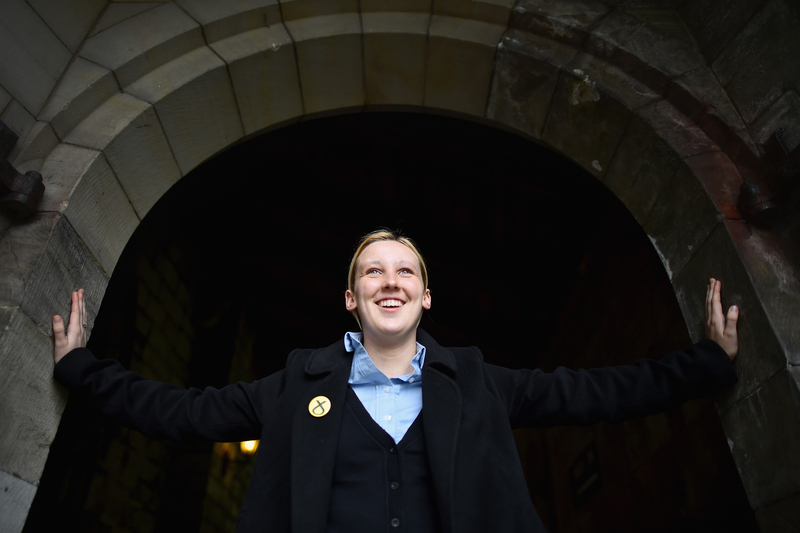 And the most startling of SNP success stories might just be Mhairi Black, now Westminster’s youngest MP for centuries. Black, a 20-year-old undergrad, won the Paisley and Renfrewshire South seat from Labour old-timer Douglas Alexander to become the country’s youngest Member of Parliament since 1667. On Thursday night it became clear that Black held 23,548 votes compared to Alexander’s 17,854. The news comes as a major upset, given that the latter is a political heavyweight and former shadow foreign secretary, and that Labour had held the seat since the 1920s. So how did this turnabout happen — and who is Mhairi Black? Nope – and I’m not saying that in an arrogant way, I’m saying that because I’m not the one who should be nervous – it’s all of them down there who have to answer for what they’ve done, they’re the ones who have to be accountable. If I become an MP, the nerves should be on their part. Not mine. At the tender age of 20, Black is not the UK’s youngest parliamentarian ever (in the 17th century, 13-year-old Christopher Monck took a seat in Westminster under Charles II), but she's also not afraid to act her age. The Daily Mail reports that she has previously admitted to having to stop herself from head-butting Labour councillors, and she has also come under fire for obscene language on her social media accounts. One Twitter post reportedly included the phrase, “Smirnoff Ice is the drink of the gods.” Ah, there’s the glint of the undergraduate poking through. Yet her political approach is mature and her motivation rooted in a firm belief in social justice. She became a parliamentary candidate in the hopes of combating “the level of poverty and injustice prevalent in our society,” according to the Mail. Her website makes clear how this might be achieved. “I truly believe that the only way to bring the powers we were promised, and the social justice that Scotland so desperately needs, is to have a strong group of SNP MP’s at Westminster to ensure our voices are heard,” it states. Despite her political acumen and recent success, Black isn’t too busy for hobbies. She’s a football fan, apparently, and an avid musician. She can play both the drums and the piano, and when asked by the BBC to name a favorite song, Black selected Bob Dylan’s “The Times They Are A-Changing.” She added, “I think that sums it up for me at the moment.” The changes she lists include an updated wardrobe (“Running for MP is the longest job interview of my life and you wouldn't wear jeans to a job interview”) and a flurry of media interest (“The New York Times did a piece on me. It's so mad”).